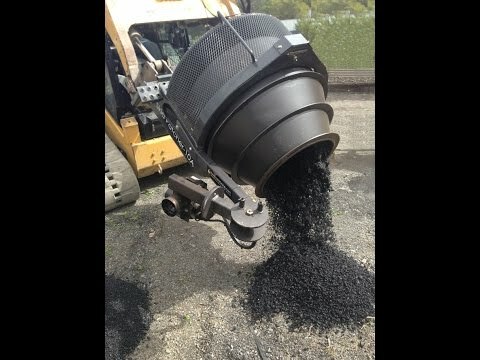 Skidpatcher-10A Asphalt Recycler 500Lbs hotmix asphalt 10-15 minutes! 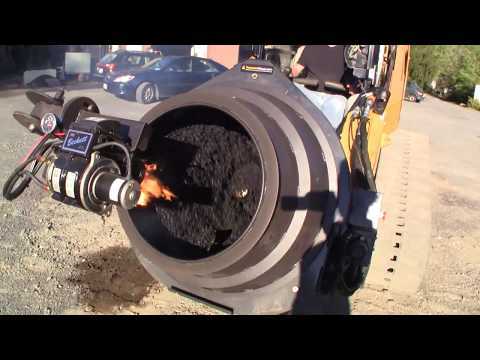 Overview: The SkidPatcher 10A is a 3-in-one multi-purpose machine designed to recycle asphalt (millings / plannings), mix concrete and mix flowable fill. The attachment easily attaches to your skidsteer loader. The 10A provides the ability to affordably produce hot mix and concrete in cold weather conditions. Skidpatcher can recycle and heat a 1/4 ton batch of RAP to 300 F in 10-15 minutes. If your mixing concrete, the 10A's heater allows you to preheat the water when necessary. Skidsteer Attachment: The Skidpatcher-10A Asphalt Recycler attaches directly to your skidsteer and can be mounted and discmounted in minutes. Adapts to both low and high flow systems. Uses a diesel burner system with an onboard fuel supply. Quick connect adapters provide convenient hookup to the skidsteer hydraulics. The skid steer operator controls the mixer rotation, heating, and dumping from the in cab operator console. Recycling: The SkidPatcher10A was built to recycle asphalt millings/plannings (asphalt RAP 2" minus) into quality 300F hot mix. Recycle a 500 batch of RAP to 300F in just 10 minutes. Ideal for contractors, highway departments, rental houses and airports. The 10A reduces reliance on local hot mix plants, by providing the ability to produce hot mix year round as well as mix concrete. History: The SkidPatcher10A Mixer technology was originally designed for the US Air Force for deployment in remote locations for the rapidly repair of airfield runways. The system is currently being deployed by the USAF to various air-fields throughout the world. The 10A system is now available for commercial use. The airforce originally tested various materials and machines for repairing airfields. The multimillion dollar research and testing project was conducted by the US Air Force over several years. The testing was designed to simulate repairing a bomb damaged runway in adverse weather conditions. GIs performed the repairs using various techniques and products, while researchers engineered the tests and evaluated the results. The US Airforce purchased 25 SkidPatchers to be used as part of their SUPR KIT (See VIDEO, below).